The flowers of the Japanese cherry blossoms remind me of the beauty and the vanity, always suddenly bursting into flowers and falling so rapidly. Japanese people bath in the afterglow of the beauty provided by the adorable cherry blossoms, that possess an inevitable short life. 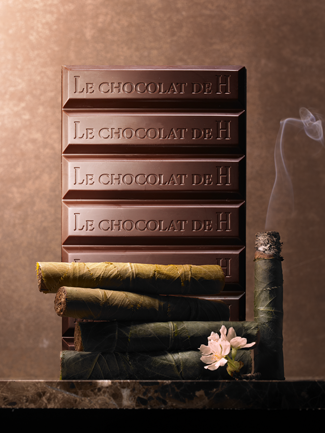 I created the chocolate, imaging my favorite moment, smoking a cigar and sipping a glass of whiskey. The Sakura Cigar is a smoked chocolate with cherry blossom wood. I would like you to relax and enjoy, letting this sweet substance dissolve in your mouth.